A neighbourhood walk is often spent looking down at our iPhones rather than the buildings around us. 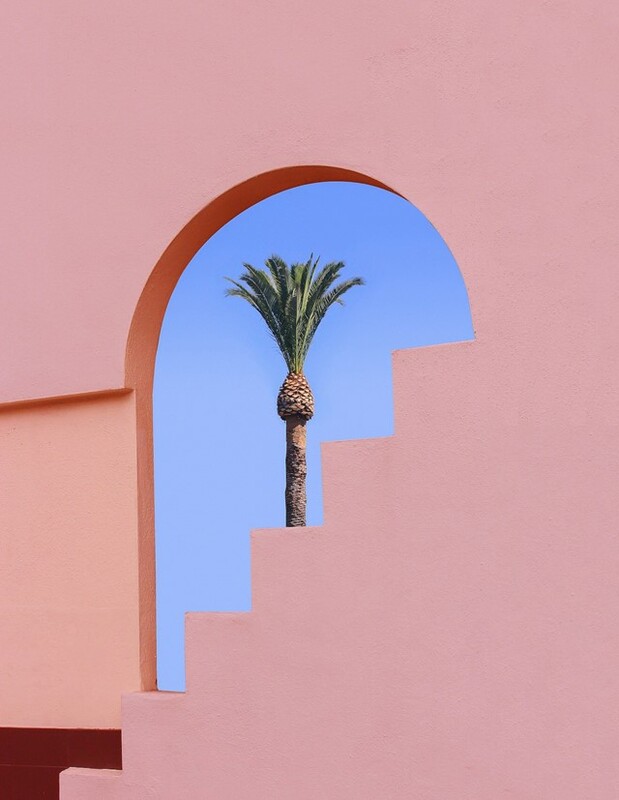 The average adult supposedly spends over nine hours in front of a screen each day, a stat that prompted San Francisco-based photographer Collin Pollard to dedicate his Instagram account to his dreamy, sun-soaked shots of California’s urban landscapes. The aim: to reconnect people with their surroundings in new and unexpected ways. “I began my photo practice about two years ago when I was living in Los Angeles,” Pollard says. “I was heavily influenced by the New Topographics photographers. I wanted to see if I could add anything new to their conversation, which is how I ended up where I am today.” Drawing on the work of Robert Adams, Bernd and Hilla Becher, and Stephen Shore, Pollard’s photographs are often stripped of context and concentrate on compelling geometric shapes created by imbricating buildings. The result is a personal feed seeped in rich primary colours and sharp, satisfying contrasts. In focusing his lens on close-ups of larger architectural structures, Pollard’s images feel like a vibrant reimagining of the world around us. Purpose and determination are what drive Pollard on his regular walks through San Francisco’s streets, scouting out settings he can draw inspiration from. “As I have gotten older, I look for very specific qualities in a location compared to when I used to wander around aimlessly (which will, of course, always be fun in some regards),” he says. Yet, Pollard estimates that only 25 per cent of his images are of real-life places. The rest are “composited together using aspects of multiple locations”. It is a playful and experimental approach – one that sees every creation undergo significant colour and composition enhancement. “I spend most of my time on Photoshop creating my own universe,” Pollard admits. “It’s a crucial part of my work. The little details need to be in place for the piece to work.” Whether it’s a perfect 90 degree angle or a flawless palm tree silhouette, the artist’s fixation with and reconstruction of each photograph’s minor intricacies opens up a liminal space that exists both IRL and in fiction. Pollard’s considered and carefully curated Instagram account is a place that encourages his followers to re-evaluate the spaces around them. The landmarks, he implies, are what you make of them. Pollard’s practice is rooted in finding – and engineering – beauty in the banal. And the enhanced images are just as crucial as the “real” photographs. “My goal is to make the viewer look twice and to question whether or not that specific location actually does exist. I don’t want people to look at my images and think that they’ve seen them before,” the photographer says. Pollard’s Instagram account draws attention to California’s vibrant cityscapes, urging you to reconsider the everyday scenes you might not otherwise have offered a second glance.